Al-Qaeda-linked militants have damaged the mosque of Ammar bin Yasir and Uwais al-Qarani in the northern Syrian city of Raqqa. 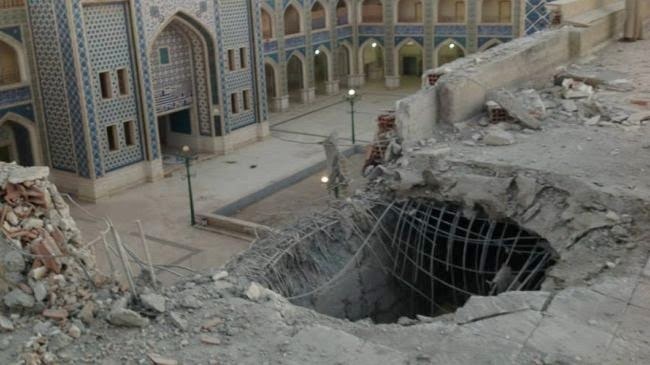 According to reports on Wednesday, foreign-backed militants from the so-called Islamic State of Iraq and the Levant (ISIL), who are fighting against the government of Syrian President Bashar al-Assad, set off two powerful explosions at the mosque of Ammar bin Yasir and Uwais al-Qarani. On Thursday, the Iranian Foreign Ministry denounced the terrorist attack and called on international organizations, including the United Nations and the Organization of Islamic Cooperation, to react to such extremist acts which run counter to international norms. “The reaction of the international community and the condemnation of such acts are the first step in carrying the responsibility for safeguarding things sacred to divine religions and preventing the recurrence of such extremist and blind acts,” Iranian Foreign Ministry spokeswoman Marzieh Afkham stated. The site, seized over a year ago by militants, was once a destination for Shia Muslim pilgrims, including those from Iran, Lebanon and Iraq. Photos of the mosque posted on the Internet on Wednesday showed extensive damage to the exterior walls and roof of the building. The pictures also depicted concrete and twisted metal strewn on the street outside the mosque with an interior wall collapsed inward.